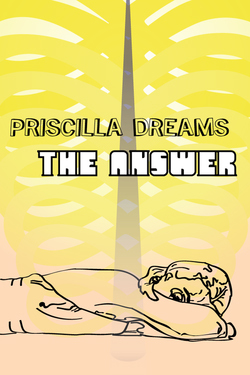 Committed to developing new work with emerging theatre artists in the New England area, Fresh Ink Theatre Company will present its inaugural production, "Priscilla Dreams the Answer," from December 8 - 17 at the Factory Theatre, 791 Tremont Street in Boston. The comedic piece is by Boston-based playwright Walt McGough, whose "The Farm" played Boston Playwright's Theater this fall. Priscilla was feeling down, until the aliens showed up. Now she's the most important person in the universe, and the fates of two planets rest on her. It hasn't made her feel much better, but at least it's something to do. A game-show savant, a dash of math and a metric ton of bubble-wrap all come together in a dreamy, funny, melancholy look at the questions we ask, and the answers we need. Directed by Melanie Garber, the company includes Michael Caminiti, Emily Kaye Lazzaro, Bob Mussett, Caroline L. Price and Dakota Shepard. Walt McGough, whose plays include "Paper City Phoenix," "True Places" and "Dante Dies!! (and then things get weird)," has had his work produced or developed by Boston Playwrights Theatre, Orfeo Group, Sideshow Theatre Company, Chicago Dramatists, Nu Sass, and the Second City Chicago, among others. He was a participant in the 2011 National New Play Network MFA Workshop, and a recipient of the Kennedy Center's 2010 Ken Ludwig Scholarship. This past summer, "Priscilla Dreams the Answer" won the 2011 Capital Fringe Festival Audience Award for Best Comedy, and he received the first short-play commission from Playwrights Commons in Boston. He is a founding ensemble member of Sideshow Theatre Company, for which he serves as Literary Manager, and currently works on staff at SpeakEasy Stage Company. Fresh Ink Theatre sprang into existence due to strong friendships formed when its founding members worked with 11:11 Theatre Company, a Boston fringe group focused on original work. When that company’s long-tenured Artistic Director stepped down, the remaining members agreed to continue working with new plays and with each other. The group banded together to carry on as a new organization, re-energized with an updated mission and re-committed to the goal of developing new, local work. For information and tickets, visit freshinktheatre.com.